We woke up today, made breakfast, said goodbye to Shelly and John (who told us not to miss out on the huge pie selection at Cooky's Diner in Golden City, MO today), and left the park excited to finally be done with Missouri's tough terrain and to enter Kansas. We had about 20 miles of hilly riding left until things gave way to gentle hills with long, slow ascents. There was, however, another bridge under construction on the route. John and Shelly had warned us about it though, and told us they had been forced to take the bags off of their bikes to get past. We found out why immediately upon arrival. The bridge was totally missing, and there was something of a small cliff for us to climb in order to rejoin the road. I managed to carry my bike whole up the slope and then Ben tied a couple of ropes together so we could pull the bikes up the slope while their owners pushed them up from behind. There are so many experiences I never thought I would have, not just on this trip, but in life and needing climbing rope to pull a few 150 lb bikes up a muddy, destroyed roadway in the hinterlands of western Missouri after riding my bike 2,000 miles just for the privilege of doing it is one of those aforementioned experiences. After the operation was complete, we got ourselves back together and ground out in short order the remaining (far afield from their bigger brethren) Ozarks that tried their best to keep us away from our pie. 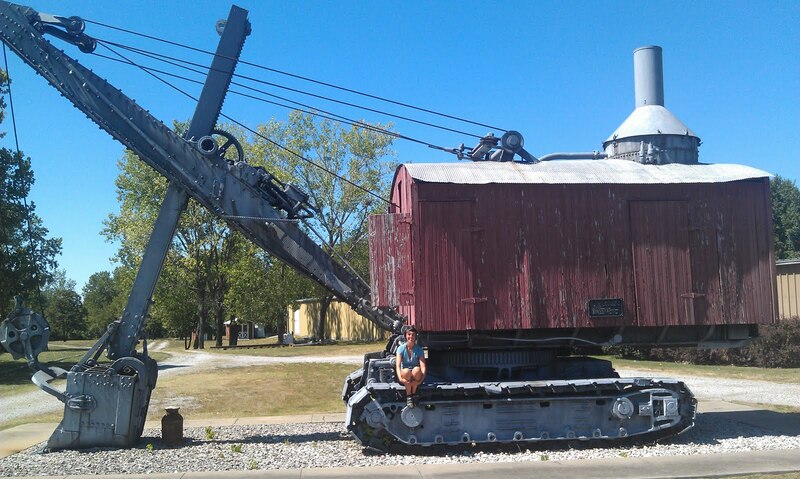 33 miles into the ride, we found ourselves in the small town of Golden City, MO and sitting down for lunch. Everyone had pie in the back of their minds and ordered lightly to save room. I had a brisket sandwich, a baked potato and a side salad, followed by a slice of chocolate and peanut butter pie with a vanilla milkshake (just to hit all my food groups). The pie was good, but not amazing, so I think it was a little over-hyped, but it wouldn't surprise me at all if someone told me it was the best pie for 400 miles, given our location. As a team of 5, we had about 9 pieces of pie and one milkshake for dessert, which left us all completely stuffed. We decided that a long digestion break would be needed. I got a haircut and had my beard trimmed (just a little) while Erin wrote postcards, and Charlie, Ben, and Mandi relaxed and poked about town. Stanley, my barber, told me that they've been seeing hundreds of cyclists a year ever since the Trans-America Trail was plotted in 1976, and that I was far from his first bicyclist to sit in the barber's chair he has manned in town for the last 53 years. Certainly a change of pace to go from town and campsite celebrities to just more bikers riding through. trying her best to disassociate from us. We'd been a bit late to rise in the morning since we'd stayed up a bit late and slept in a little bit, too, so the day had somehow gotten on to nearly 4 o clock and we still had another 30+ miles to go. The rest of the day was, as promised, pretty darn flat. In fact, before we'd even reached Kansas we were tired of the flats. Somehow, we'd gone from whining about hills to whining about flats nearly immediately. The real advantage is, obviously, that we can ride a lot faster through Kansas and eastern Colorado than we did any of the other states. When we did eventually cross the border from Missouri to Kansas, we were all happy to be there but all of us were already looking ahead to the next big thing: the Rockies, which were now only a state away. From the Kansas border, it was a short 6 mile ride into Pittsburg, a large town on the edge of the state. We showered off at the YMCA in town and found our way to Lincoln Park, where the police told us we could set up camp. We were all a bit worn thin from the last few days and, after some beers and a nice mac-n-cheese and chorizo dinner, we all decided a slow start to the next day wouldn't kill us. I wanted to check out the bike shop in town (the first we'd seen in hundreds of miles) and they didn't open til 10 AM; we decided to wake up late and head there after breakfast. never turn, and move your legs in a circle. We woke around 8:30 and it was immediately apparent that no one was in a hurry to get moving today. We dragged our feet as we packed things up, and decided that to get breakfast somewhere in town, rather than cook. Charlie split off momentarily to go to the bank, so the rest of us found our way to Daylight Donuts, a tiny cafe just a couple blocks from the bike shop. We got some coffeee and several donuts and loitered in the shop, reading the paper and watching CNN til about half past 10. The bike shop turned out to be something of a bust, again, as they weren't very well stocked and the owner, while plenty knowledgable, was too busy to really do anything for us. We used some of his grease and then ran a few more errands around town; we bought wool hats that were thin enough to go under our helmets (for the mountains) and grabbed some supplies at the Wal-Mart in town. By the time we were all actually ready to leave, we were hungry again. We grabbed a quick bite of fast food and didn't really get our day under way til nearly 1 in the afternoon. 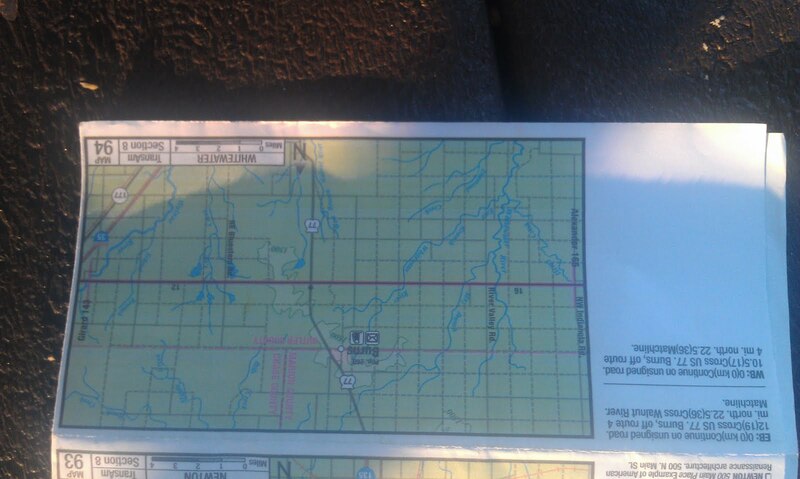 We learned very quickly that there is very, very little in Kansas, at least along our route. Hardly any towns, hardly any hills, hardly anything at all but cows and mile upon mile of expansive prairie. The scenery here is totally unlike anything I've ever seen. The surrounding views are often barren of anything but a few scrubby trees, some kind of weed with very pretty yellow flowers, dry grasses in the grazing lands, dust devils, and fine brown dusty soil . Like Missouri, though, every Kansan has been hospitable and friendly, and we get more waves from passing cars in Kansas than we have anywhere else. The ride to Walnut, our preordained lunch stop, was a quick and painless affair. We've heard many horror stories from the cyclists we've met on the trip and from people we met before we left about brutal headwinds sucking the life out of you in Kansas. Luckily, we haven't been the victim of any yet, and if our luck holds, we won't be. There is, however, always wind here and thus far it's only been a north wind. When we got to Walnut, which I think has a population of 71, we went to His and Hers bar for a beer and a burger. The two other patrons at the bar chatted with us for a bit- they see cyclists fairly often, even there- then went back to conversing with each other about the merits and demerits of docile bulls, the weather, and what was on TV. is going to start a steam shoveling business on arrival. We took our time in Walnut, too, but even our glacial break-taking pace gave way eventually to the urgency of the soon setting sun. We have slowly learned the value of the pace line in our 2000 miles, but haven't had nearly as many opportunities to ride in one as the northward turns in Kansas have offered us these last couple days. We rode tightly from Walnut to Chanute until we found ourselves fighting through yet another gravel and dirt road under construction. Thankfully our campgrounds, the city park, were just on the other side of the work zone. Now, I'm sure I've mentioned this before, but since we've crossed the Mississippi we haven't had to pay for camping yet. Most city parks are open for cyclists to camp for free. Some have showers, some don't. Some have running water, some don't, etc. But if you pick your stops wisely, you'll never be without the very basic necessities. Chanute's park was not nearly as large as Pittsburg's, but it was a bustle of activity as several co-ed rec. softball teams got their weekly games in, RVers drove in and out, and the locals went for a nightly run or ride past us. We have long since gotten over certain modesties that having household amenities will nurture in a member of normal society, and we changed clothes, took showers, cooked, and set up our bedding in the middle of the suburban swirl of activity that surrounded us. We whipped up a camp dinner and went to our sleeping pads just as the softball field lights were shutting off. Today everyone slept in even later than we have the past few days, because we were finally in sight of a day off. In the last week we'd covered nearly 500 miles (including this day's ride and our 13 mile semi sick day), crossed the most difficult geography we've seen yet, and did it with no problems at all- it was time for a break. Not counting Chester as time off- because it really wasn't, since everyone but me spent the day puking their guts out- we hadn't had a real day off since Hayes Canyon Campground where we met Charlie in Eddyville, IL. 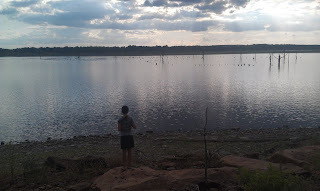 We set our sights on Cross Timbers State Park, which we heard was beautiful and cheap camping, and only a short 40 mile ride from Chanute. Again, this morning we were in no hurry to get back in the saddle, as everything was a little stiff and creaky from the long week. We spent the morning doing laundry at the Super 8 Motel across the street from the park where we basically blockaded their lobby and entrance way with bikes for a couple hours while we ate breakfast and snatched donuts from their complimentary spread while the front desk clerks weren't in the room. The 40 miles we had to go to the park were all prairie with only a few tiny towns that had neither restaurants or stores of any kind and one lonely gas station the whole way. 11 miles in we stopped at the gas station for a quick candy bar and peanut butter cracker snack before remounting. Kansas, it seems, is also in the throes of a serious drought, much like many of the other states we'd passed through to get there. However, in Kansas, the natural dryness seemed to accentuate the drought conditions. Trees here are bleached white and adorned with sad, dead, dry branches, the cattle huddle in the scant shade provided by the few trees in the roadside pastures, and even the few cacti we saw looked a bit shrivelled up. A man I talked to in the Super 8 told me, "This isn't dry, wait til you get to the western part of the state. This is nothing compared to that." He then went on to tell me about how the recently discovered oil in North Dakota and Canada will "solve the energy crisis if we let it" and that if I can't find work in Portland, I should North Dakota instead. "3.8% unemployment, and a cook in a restaurant makes 50 grand a year, a cook!" I didn't bother getting into energy politics with him, but he was good natured enough and gave us some advice about Colorado and the rest of his state. Luke and Joe pose for us by the roadside. After the gas station, we rode essentially without pause until 36 more flat, relatively fast miles had gone by. We were rounding the land on which the state park is situated when we came up another pair of cross country bikers: Lucas and Joe. Luke and Joe, whose blog can be found in our blogroll and at www.usbiketrip.blogspot.com (they have the same background picture as us, for shame! I'll change it soon), are riding from San Francisco, CA to Fairfield, CT, where they're both from. They are, for all intents and purposes, going to be following nearly our exact route back to Connecticut. We had a small convention on the side of the road, all seven of us in the middle of the country (since we are basically half-way and they are too), and swapped stories, advice on food and lodging, and lingered there for probably 30 minutes as we chatted with the two friendly and fun guys. They have been covering roughly 100 miles a day since getting out of the mountains and are travelling pretty light and fast compared to our little caravan. We took some pictures and wrote down some last scraps of advice before bidding them adieu. Good luck Joe and Luke, ride safely! Erin in front of the lake. It was really beautiful there. After parting ways with the unexpected duo, we went straight into the pint-sized town of Toronto and directly to the cafe Joe and Luke had just left. I had a 1/2 lb burger with a fried egg, jalapenos, and bbq sauce on it with a side of crinkle fries before helping Erin with a big slice of pie for dessert. We grabbed a few beers from the package store next door and headed into the park to set up camp, glad to be winding down a short day. The woman collecting fees for the campsites was very sweet and only charged us half price for the two days we intended to stay, but told us to scare away any armadillos we saw (since we saw one immediately on entering the park). 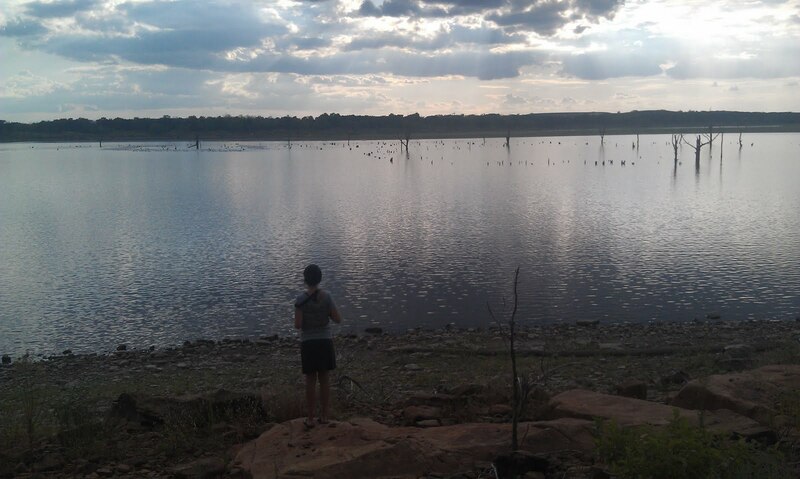 We agreed to her terms and set up our camps in easily the prettiest park we've camped in yet- in Kansas of all places. The campsite is a surreal blend of super dry scrubland, oak and mesquite trees and prairie jammed up against a big reservoir, created by the building of the Toronto Dam. The lake and surrounding area is as picturesque as it is seemingly disjointed. We polished off our beers and some ramen noodles and went to bed. The full moon threw off a ton of light that night, and the coyotes were making quite a racket when the cries of alien waterfowl weren't echong across the lake. It was a little hard to sleep with all the new, odd noises ringing through the night, but Erin woke me up after hearing a more familar noise: raccoons digging through our stuff. When I emerged from the tent to shoo them away, all I saw was three round, plump raccoon butts high-tailing it out of the campsite. In the morning we found their little muddy paw prints all over our food bags, but everything was undamaged. Pesky little cusses. After a long pancake and sausage breakfast we did a bunch of bike maintenance today: swapped rear and front tires, changed brake pads, and lubed our chains, shifters, and brake cables. We went back in to town for lunch, and are planning to get a good dinner, a good night's sleep, and an early start. 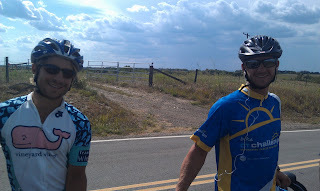 We're planning on doing our first century (hundred mile day) tomorrow, and we plan to be in prime shape for the ride. The wind looks like it'll be the same mild cross-wind we've had since entering the state, so all that's left is the riding.